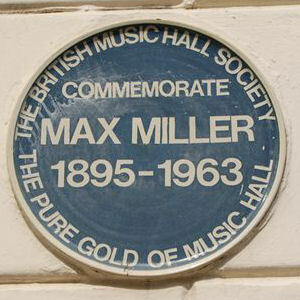 Born Thomas Sargent in Hereford Street, Brighton, in 1895, Max Miller topped the bill in music halls and theatres for the best part of half a century. He served in the First World War and, in 1919, started a long showbiz career in a seaside concert party with Jack Sheppard’s Entertainers in Brighton. Max Miller became a household name but never lost his Brighton roots. 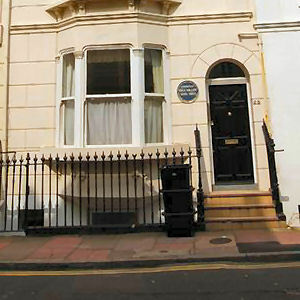 He lived in Burlington Street for fifteen years at the height of his fame. He loved home so much that he had a clause built into his London contracts that he should be able to catch the last train back to the coast. Known as the ‘Cheeky Chappie’, Max was the master of the double entendre and innuendo. He was never directly lewd although his near-the-knuckle humour got him into trouble with the BBC. Max was always dressed in his famous flower-patterned suit with the slightly tilted trilby hat. His signature tune was ‘Mary from the Dairy’. Brighton has celebrated its most famous entertainer by erecting a statue to his memory and naming a bus after him. A few Sundays ago I attended the second unveiling of the Max Miller statue. The first time the statue was pointing towards the Theatre Royal, but now it is pointing towards Church Street. Can anybody explain why? In its old position, the statue was situated in front of a west facing wall, the finger pointing towards the Theatre Royal. Appropriately so, as Max appeared there. In its new position, the statue faces north towards New Road and Max points towards an office block which was built on the site of the oldest music hall in Brighton, the Empire (1892-1967). His other house is in Southwick, just a couple of miles from this one. It is now an old people’s home but used to be owned by the CEGB. I lived there for a year along with other lads as we were all first year apprentices. I was also one of the CEGB apprentices (1966/7) who lived in Max’s house. It was, and still is, in Kingston Lane. As it is on the west side of the lane it is actually in Shoreham. I had to live there despite the fact that I lived about a quarter of a mile away in Cross Road, Southwick. I love Max’s routines and I count it a great privilege to have lived in the old part of the house. Our room was the front corner bedroom where Max may have actually slept.